Is this an Austrian stamp? Two or three questions reach this site every month, describing (and rarely illustrating) a mysterious stamp. The enquirer believes it is an Austrian postage stamp, but cannot find it in any stamp catalogue. Usually it is loose; it may have an almost-readable cancellation or perhaps a sqiggle in ink; occasionally it is stuck on a piece of paper. What is it? Quite often it's one of these, which are REVENUE stamps, used for the payment of a tax. The tax could be on mortgages, house deeds, residence permits, almanachs, documents produced in a law court, driving licences ... the ingenuity of the Habsburgs in finding things to tax was unexcelled. The study of revenue adhesives (and imprints) is a subject at least as vast as postal adhesives; an extremely brief listing of the more common Austrian revenue adhesives is here. Other revenue stamps exist; these are sugar tax; share transfer tax; share transfer tax; Vienna local tax; and a stamp for paying ones car licence in monthly instalments. These are cut-outs from parcel cards; the designs shown are those for 1888, 1893, 1899 and 1905. The tax is flat-rate on the paperwork involved in transferring goods, not on the value of the goods. This is an example of an Austrian Newspaper Tax Stamp; the link takes you to a brief outline followed by images of a 64-double-sheet display. These Red Cross charity stamps are an example of Cinderella stamps (also called 'Poster Stamps'). Many more Cinderellas are shown here. This is a Personal Stamp. 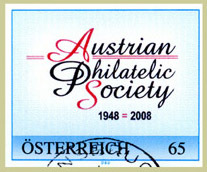 These are official productions of the Austrian Post, fully valid for postage - but usually designed, commissioned, paid for, and delivered to any firm or private individual that cares to participate. Much more information on Personal Stamps is here. The Austrian Post Office likes flowers-on-stamps, and for example the 2007 series of definitives featured flowers. However not all flowers are equal! As well as Personal Stamps that look much the same as the definitives, there are Subscriber Bonus Stamps of a similar design. You might see them on mail from a philatelist; very few catalogues list them.